Cobh Connect is fast, comfortable coach service linking Cobh and Cork City. We are an Irish owned company offering a low cost, high value service for the residents of Cobh and Great Island. We offer 24 departures six days a week and have multiple designated pick up and drop off points strategically located around the town on its journey to Cork City. Beginning at quarter past seven in the morning, this fast and frequent service will journey to Cork finishing at Patrick’s Quay and the service continues into the evening. 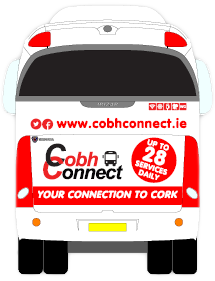 Cobh Connect operates a fleet of fully seated, air-conditioned executive coaches, all of which are 4G Wi-Fi enabled with charging points on board as standard. The fleet of modern, high capacity buses aims to make the daily commute for secondary school students and students of colleges such as UCC, CIT and the College of Commerce, more flexible, reliable and affordable. Cobh Connect – Your Connection to Cork!